Saturday 8th July 2017 - A warm and mostly sunny day. 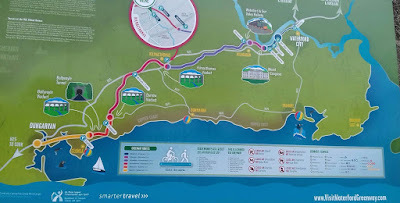 This morning we left Skibbereen via Lidl and headed off towards the last section of The Wild Atlantic Way - and would you believe we actually had a proper plan - however, as often happens, it didn't quite pan out! We'd spotted a WildCamp spot (on the Camper Contact website) on the lovely sandy shoreline of Coolmain Strand, but when we got there the parking area was rough and nearly full, so there was no room at the Inn for T4rdis2's major proportions! Therefore, we had no choice but to continue on along the road that hugged the shoreline, but as we went we kept our fingers crossed that another place would turn up - and it did! T4rdis2 managed to slot in with a couple of other motorhomes on a bit of high ground overlooking the ocean and with the Blue flag beach of Garrettstown on one side and Garrylucas beach on the other. It was a perfect (and free) place from where we could watch the tide tracking in and out, and from where we could take a walk out onto the peninsula of The Old Head of Kinsale. This peninsula is one of the longest in Ireland and sticks out about 3 miles into the sea, but the far end is almost cut off from the mainland by a narrowing in the middle, and unfortunately this is the bit that's inaccessible because it's a privately owned by a golf course. However, what we saw was very beautiful - we thought we'd already seen all the best bits of The Wild Atlantic Way, but as we go it just keeps giving more! carnivorous cavernous opening he had to be quick in checking it out - however, the cave we found turned out to be a bit of a tease - and we never did find the real thing! Anyway, after that little exertion the next thing on our agenda was tea, and really we had two choices! It could either have been a bit of garlic with some of the many snails we saw while we were walking, or as we were sat overlooking the Wild Atlantic - we could have Atlantic salmon - no competition really - the latter won flippers down! The Moon Falling into the Sea! Sunday 9th July 2017 - Warm and sunny to start but a cloudy evening. Today's been one of those days where there really isn't much to say! We left our sea view perch and quickly bid a sad farewell 😢😢 to The Wild Atlantic Way as we headed off across Ireland's southern coast towards Cork and our final campsite of this tour. We landed about lunch time at the packed Casey's campsite near the town of Dungarvan, and since then we've been quite lazy and just lozerked about in the sunshine! We're saving ourselves for tomorrow when we plan to ride along a big chunk of the Waterford Greenway - a 46 kms off road cycle-way that claims to be spectacular - we'll see! Monday 10th July 2017 - Only glimpses of sun today and a massive downpour in the early afternoon! Now, most people on their birthday's choose something like taking it easy, putting their feet up and maybe going out for a little treat in the evening - but Oh No. Today, for his amusement John chose a 43 mile bike ride - but I suppose I ought to look on the bright side - at least there were no big hills! Our aim was to ride along some of the Waterford Greenway - an old railway line from Dungarvan to Waterford City, but we knew we wouldn't make it all the way because that would have resulted in us peddling 57 miles (there and back), and that would just have been a wee bit too far! So we made our target Kilmeaden, and along the way there was plenty to see. First came a section that was elevated above Dungarvan Bay which provided lovely oceanic views, and soon after that we found ourselves on Ballyvoyle Viaduct - but because of the lay of the land and because we were on top of it we didn't manage to see any of it's old architecture! Next came the Dark Dark Ballyvoyle Tunnel - a 400 metre burrow like structure that entered into the earth and seemed to swallow us up, and a place that allowed our voices to echo around atmospherically! And then as we exited the tunnel we found ourselves in a leprechaun glade - there were lots of little doors to the caves where the little guys lived and thrived - but we thought they must all be on 'night duty' cos we didn't see anybody pottering about! Our ride then traversed through pretty valleys with views of the Comeragh mountains to the north, and it also took us over our second viaduct of the day at Durrow. Here we found the ivy clad ruins of the old Durrow Station where the platform and waiting rooms still stand - but we were a bit disappointed - because although a lot of care had been taken to deck the area with flowering tubs etc - there wasn't a bench or any where to sit in sight! Therefore, we pressed on through lush countryside until the old Famine Workhouse at Kilmacthomas (which dates back to 1850) came into view. And at this point we spotted a pretty little park area so we couldn't decide weather to stop for lunch or press on to our ultimate goal - Kilmeaden. We did the latter but wished we'd done the former - Kilmeaden is the home of the Waterford and Suir Valley Heritage Train - but it only runs for 500 metres - so definitely not one of 'The Worlds Great Train Journeys', and the place was heaving! So once we'd had a little look around we turned tail and headed back to the garden area at Kilmacthomas where we just managed to scoff our lunch and get going again before the heavens opened! We were soon soaked through to the skin, and the rain came so heavy it was difficult to see where we were going at times. But luckily it only lasted for about 10 minuets, so after that we upped our power to 'Tour' and dried ourselves off in the 15 mph breeze we created as we dashed along! By the time we got home we were mostly dry, but it was a good job we'd hurried as the rain just kept coming for most of the evening after that. But it really didn't matter to us because we didn't stir out of our door again - instead we flipped the cork on a bottle of 🍷🍷 and shared a lovely home cooked steak dinner with apple pie and custard to follow! Today we were once more kept captive inside the comfy confines of T4rdis2! We had planned to go out for another ride - or maybe a walk as this was our last full day in Ireland! But we thought it really wouldn't have been much fun in the rain, so we stayed put, and maybe it was a good thing really, cos John's got a lot of driving to do over the next couple of days, so a day of rest is possibly just what the Doctor ordered. And me - instead of resting I cooked and baked! Carrot and coriander soup, cherry cake, flapjack, and then sticky ginger and orange chicken for tea! Wednesday 12th July 2017 - Lots of lovely sunshine. Would you believe it? Yesterday we were stuck indoors all day cos of the rain, and today when it would have been lovely to go out, we've got to travel! Our ferry from Rosslare to Fishguard isn't till 6pm but we needed to be off the campsite by mid-day or we would have had to pay a late departure fee. Therefore, with only a 70 mile journey to cover we had plenty of time to spare - and we thought we'd be able to spend it on Rosslare Strand/Beach - but over here the children break up earlier than in England and the holiday season is in full swing now. Additionally, as it's a lovely day everybody was making the most of it, so there were no T4rdis2 sized gaps for us to park in when we got there. So round we spun and we eventually found a pretty little lay-by with flowers, a stream and 🐄🐄🐎🐎 grazing nearby - and although it would have been nice to be beside the sea - our spot made a handy resting place until it's time to go to the Port for our departure back to Blighty.